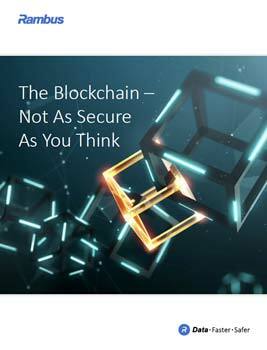 Building upon a foundation of bank-grade and field proven tokenization technology and expertise, Rambus Blockchain tokenization solutions combine multi-signature with tokenization technology to enhance security, confidentiality and privacy by replacing sensitive credentials—such as private keys for blockchain and crypto assets—with a non-sensitive equivalent token that is unique to each transaction. Blockchain is gaining increased traction across industries with the decentralized public-ledger framework opening new use cases daily, extending beyond cryptocurrency into financial services, retail, real estate, healthcare, insurance and more. While it provides a trusted and immutable record, the blockchain is not completely secure. The Blockchain stores assets of value at an address in a public ledger using a private key. Much like a card or account number to access funds, that key is all that is required to access that digital asset, and if it is lost or stolen, that value is gone. This vulnerability undermines consumer confidence and limits the ability for companies to offer products that help comply with regulations and best practices. With additional trust and transparency, the potential for blockchain use cases to transform the global technological landscape can be realized. Multi-signature enhances the level of security by introducing additional distributed keys for recovery and authentication of transactions, but still relies upon the use of original keys that are vulnerable to attack. Rambus blockchain tokenization technology replaces and protects the underlying value of digital assets transacted on the blockchain by converting critical information into anonymized data, or ‘a Token’. This token can then be shared and transacted securely with its ownership being clearly registered to its point of origin. This enhanced encryption applied to the securing of digital assets transacted on the blockchain results in a far more trustworthy and dynamic blockchain ecosystem.